Green tea has long been admired for its calming effects. Now this delicious substance is being recognized for its fundamental nutritional uses. A Superb Spicy Chai Green Tea! Summary : Green tea and chai? You bet! This tea from the Dragonwater Tea Company (now out of business) is a superb green tea with an awesome spicy taste. If you like green teas and chai teas, this tea simply combines the best of them both to produce a very tasty and unique flavor. Review : Well, here it is, nearly midnight...and showing all too similar traits to someone without a life, here I am, sampling teas. After earlier this evening having an awesome dinner of Thai Spicy Stir Fried Rice from my nearby Thai Restaurant, washed down with some wine, I strangely found myself in the mood for something spicy. Yes, I'm a spice-a-holic...so what? We all have our quirks...and one of mine is very spicy things. I was especially intrigued by this tea from the Dragonwater Tea Company (now out of business) because this tea is a green tea, not your typical chai black tea. As I had never tried a chai green tea, I was very interested to see how this tea stacked up against traditional chai black teas that I've tried...most of which I've really liked. This tea contains the following ingredients : Green Spicy Chai Tea. 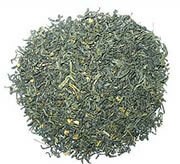 Chinese Sencha green tea blended with cardamom, ginger pieces, cloves, black pepper, spearmint, and flavoring. I knew, just knew I tell you, that I was going to really like this tea. The aroma of this tea out of the foil bag the tea comes packaged in is, well, superb! My nose instantly fell in love with the mix of pepper, spearmint, ginger and cardamon found in the tea. And while I've been burned many times before by teas that had a great aroma only to have a lousy taste, somehow I just knew that this wouldn't be the case here. And indeed it wasn't. Once brewed this tea takes on a very light tan color to it. And the flavor...well...dare you ask? Well, ok, the flavor was superb, how's that? Unlike some other chai teas that do not use pepper, this tea does. However, Dragonwater smartly used the pepper sparingly here...this tea will not jump out at your as some sort of overpowering, high-octane pepper tea. Instead, the pepper in this tea adds just enough "kick" to the tea to make it lightly spicy, all the while avoiding overpowering the flavor of the tea. The flavor itself is tough to describe, admittedly. You'll definitely taste the ginger, as well as the pepper and cardamon too. Even the spearmint flavor is subtly found lurking in the background. Yet, none of these flavors overpower the other. Instead, these flavors somehow combine to produce a unique, light, and just a tad spicy flavor that is highly unique to the world of green teas. Overall, if you have never tried a chai tea before, I strongly recommend you give this tea a try. It is, quite simply, superb. Moreover, if you love green tea but are getting bored with it's taste...give this tea a try. This tea has just enough "kick" to it to make it interesting without killing off the other flavors that have been infused in the tea. Recommendation : Absolutely. This tea is the absolute perfect blend of green tea and "other ingredients." The tea has a great flavor to it, is just a tad spicy but also possesses a wonderful hint of ginger and spearmint. If you love chai teas, absolutely, positively, give this tea from the Dragonwater Tea Company (now out of business) a try. Brewing Instructions : Use 1 teaspoon of tea leaves per cup. Pour water with a temperature of 180 degrees over leaves. Let brew for 1-2 minutes. Dragonwater Jasmine Green Tea : A superb green tea that is scented with jasmine flowers...and produces a delightful tea that is absolutely perfect in all ways. Dragonwater Green Spicy Chai Tea : An absolutely top-notch green tea that has a bit of kick to it as well as a nice, subtle flavor of ginger and spearmint. A chai tea lovers delight!